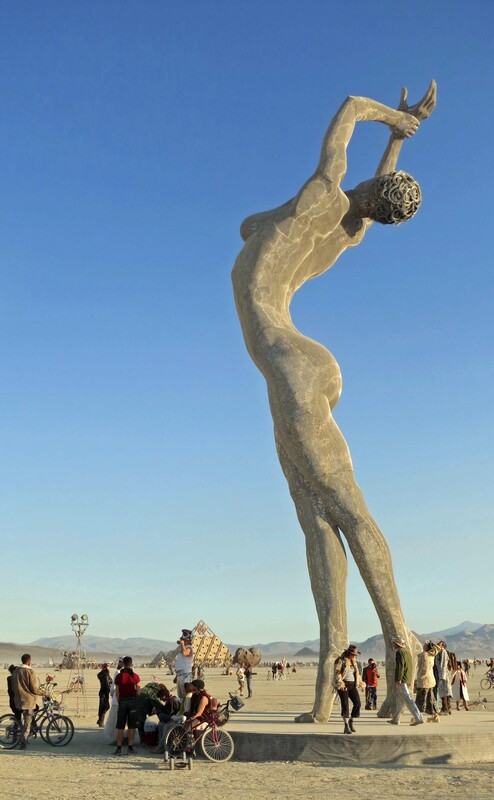 Truth Is Beauty is one of three colossal sculptures created for Burning Man by the Bay Area artist Marco Cochrane. 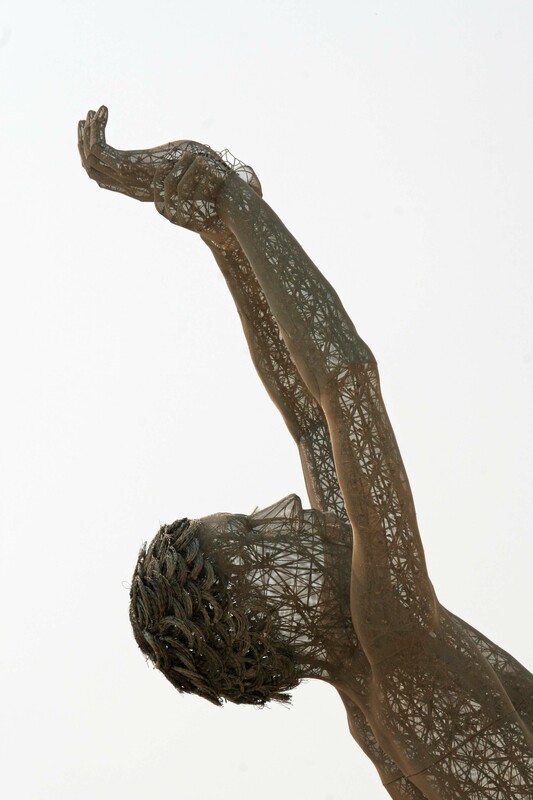 Each of these sculptures captures the beauty of the female form but goes further. Marco’s works are designed to help us see women as total human beings instead of objects. Not to detract from Cochrane’s message, but I decided to kick off today’s post with this photo because I spotted a bit of green along with the truth. Happy St. Pat’s Day. 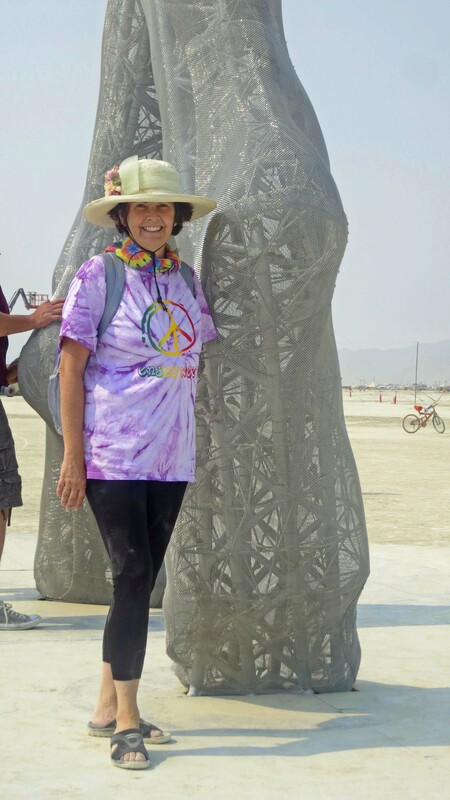 Now that I have finished my series on Burning Man’s creative and sometimes wacky mutant vehicles, I am ready to take on another aspect of the art that seems to bloom and thrive in the Black Rock Desert, sculpture. I am going to start with something big, really big— colossal women. 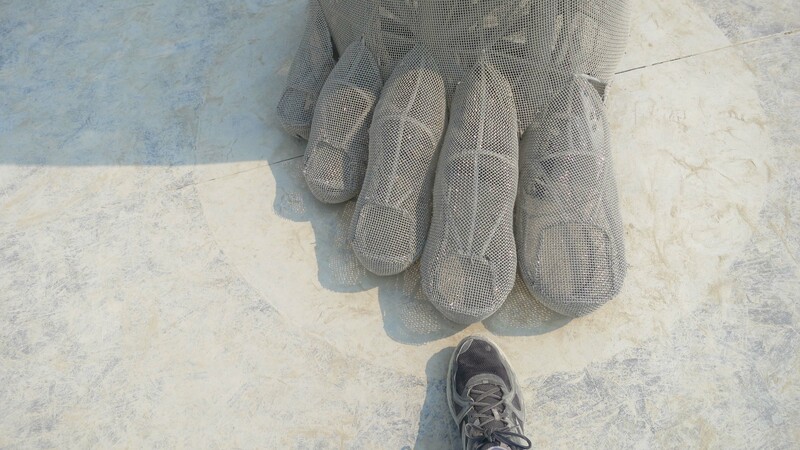 We are talking 40 to 60-foot-tall sculptures here! 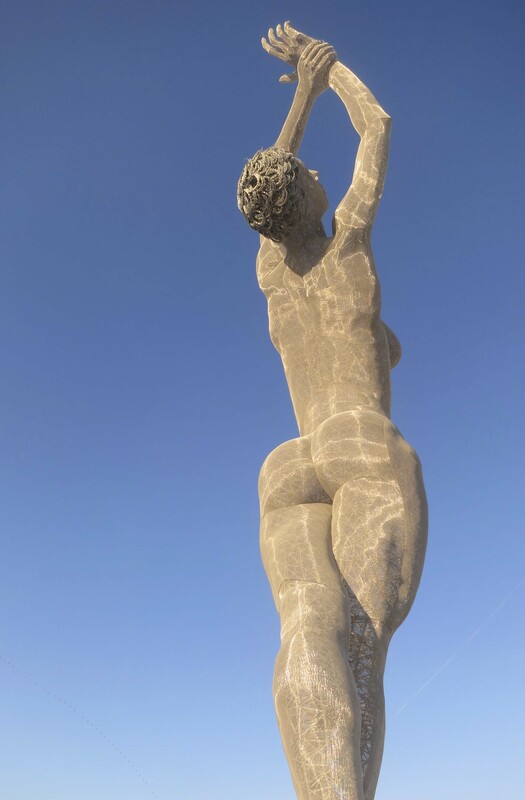 Three artists have been responsible for creating the giant women of Black Rock City, Marco Cochrane, Karen Cusolito and Dan Das Mann. Das Mann and Cusolito, working as a team, produced a series of works at Burning Man between 2005 and 2007. Mann’s interest in monumental art started with a degree in Landscape Architecture from Rutgers University. Cusolito’s introduction to the art world followed a more formal path with studying at the Rhode Island School of Design and Massachusetts College of Art. These photos are from Mann and Cusolito’s 2006 and 2007 art at Burning Man. My introduction to the art of Karen Cusolito and Dan Das Mann was this tall woman with her arms reaching toward the sky. 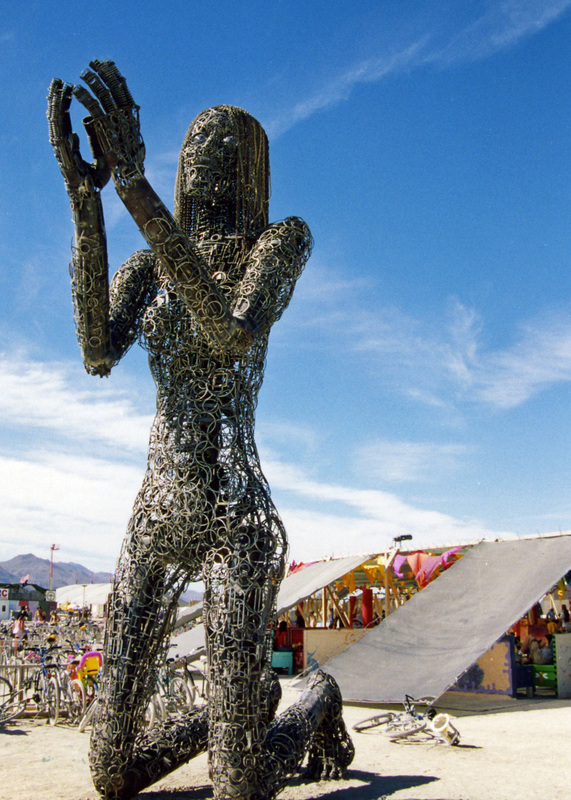 She was located in front of the Center Camp Cafe which is considered a position of honor for art at Burning Man. She was accompanied by this woman kneeling in supplication. Another photo of the two with the Black Rock Desert for background. This one shows the art’s location in relation to Burning Man’s Center Camp Cafe. For 2007, Cusolito and Das Mann created Crude Awakening. This sculpture caught my attention. Fire shoots out from the hands. Check out the chain hair. Marco Cochrane was born in Italy to American parents in 1962 and raised in the Bay Area. According to his website, “he identified with the female struggle with oppression and saw feminine energy and power as critical to the world’s balance.” His art reflects this belief. 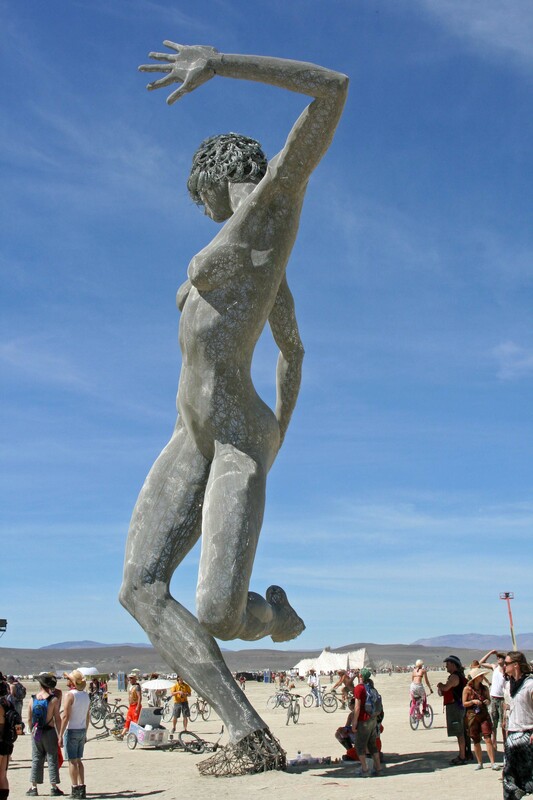 In 2007 he attended Burning Man and would have seen the sculptures by Das Mann and Cusolito. 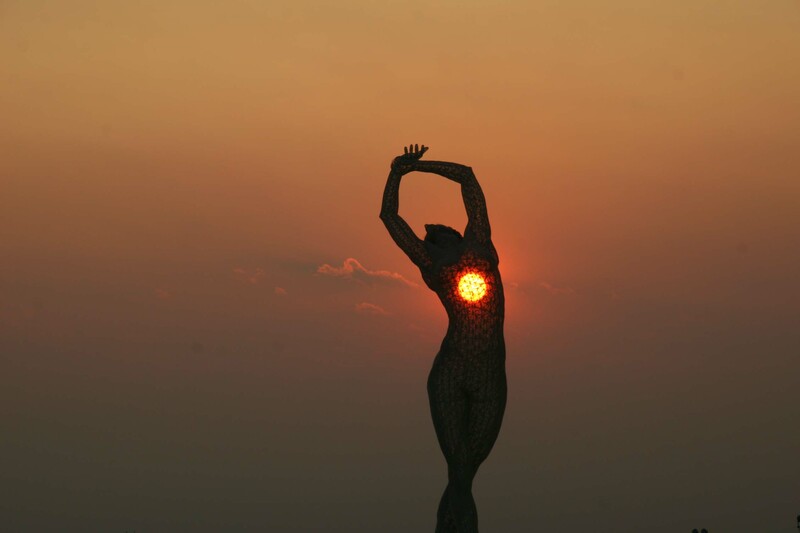 Eventually, he returned to Burning Man in 2010 with the first of his own colossal sculptures, Bliss Dance. 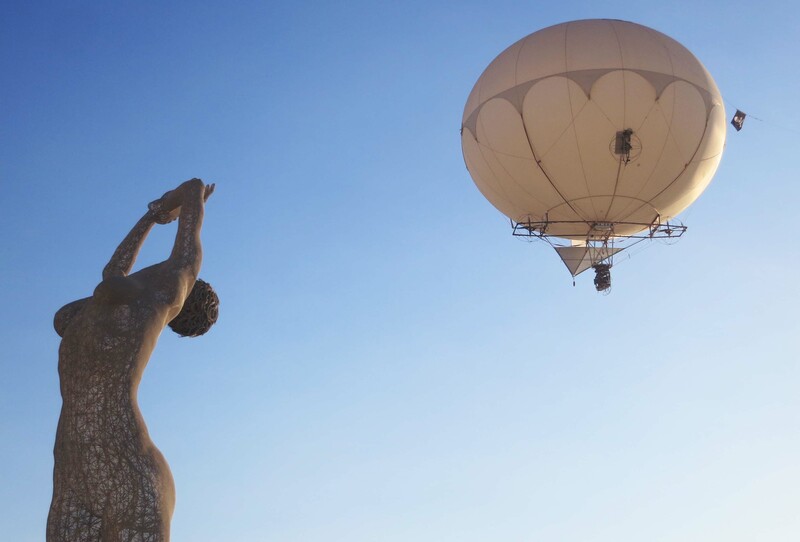 In 2013 he brought Truth Is Beauty to Burning Man and in 2015, R-Evolution. I’ve blogged about each of these creations in the past. Following are a few of our photos. Cochrane’s first work, Bliss Dance, was my favorite. 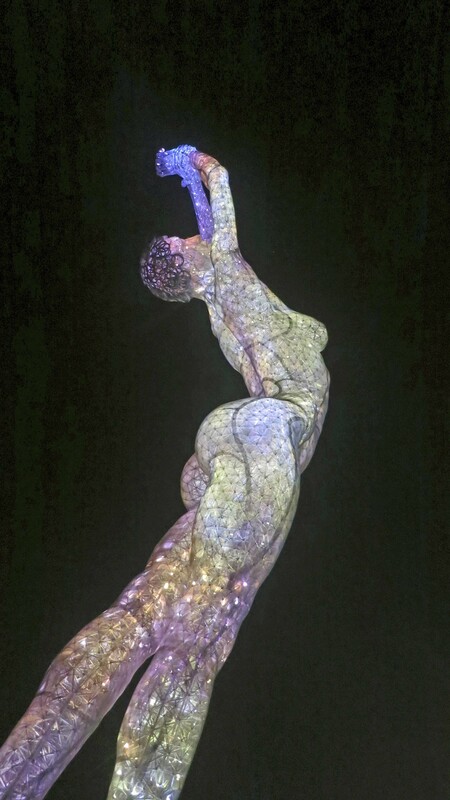 She now resides in Las Vegas just off of the Strip. I like the playful nature of Bliss Dance. I introduced this post with a night photo of Truth Is Beauty. 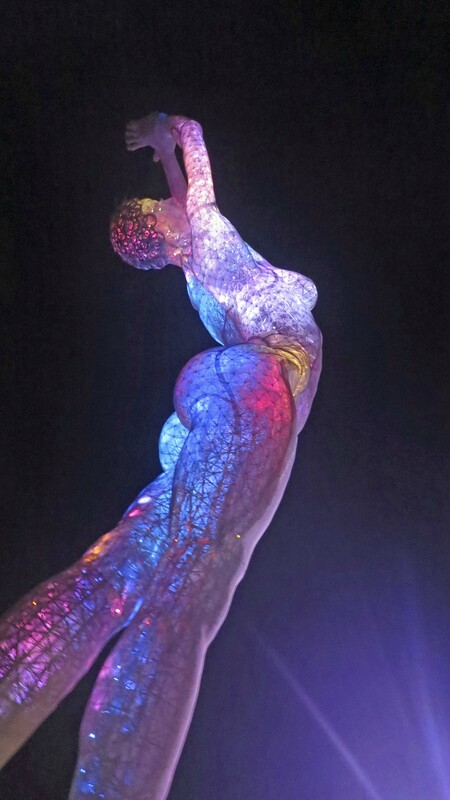 The sculpture shares this picture with other Burning Man art. This photo provides a side view. The people give perspective. A back view. Each of Cochrane’s works are powerful from any angle. A night-time view of R-Evolution’s back. And a front view to complete this post. The Sierra Trek: We backpack through 106 degree weather, and the Sheriff pays us a visit. 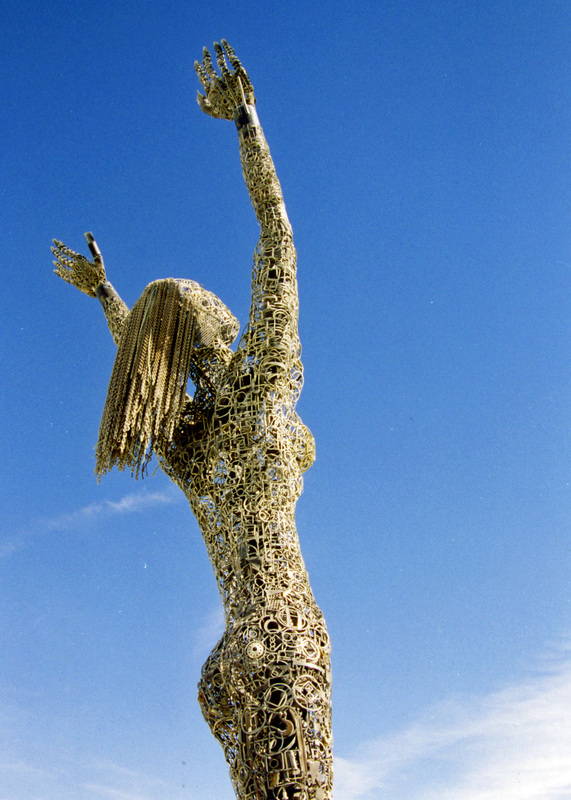 More of Burning Man sculptures. I return to Burning Man for a number of reasons but the art is what truly captures my imagination. 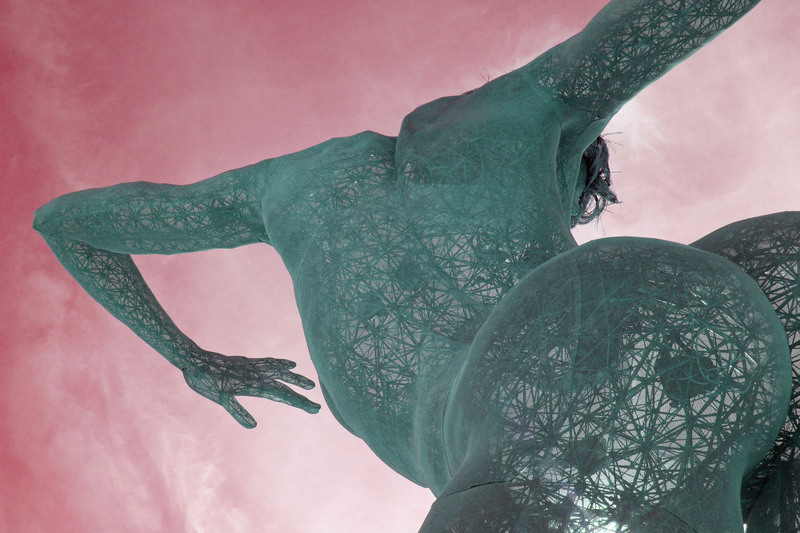 This sculpture by Dan Das Man and Karen Cochrane is titled Ecstasy. At night, fire shoots from the statue’s hands. Art, for me, is the essence of Burning Man. 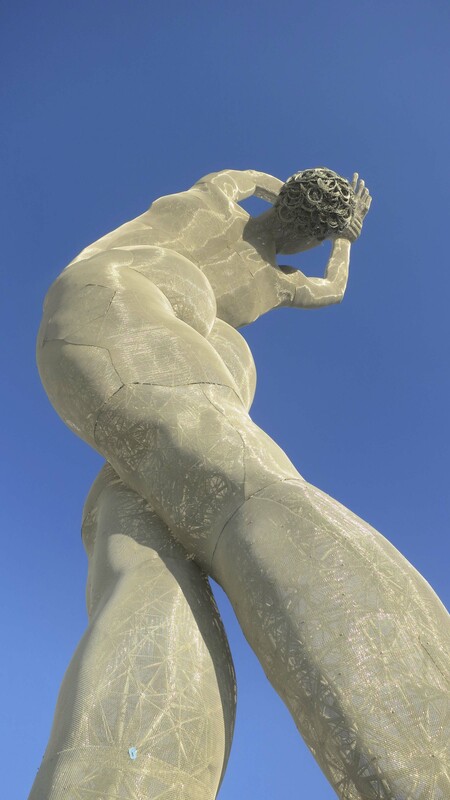 Today I am going to feature three monumental sculptures that I found to be particularly impressive during my six visits to Black Rock City. 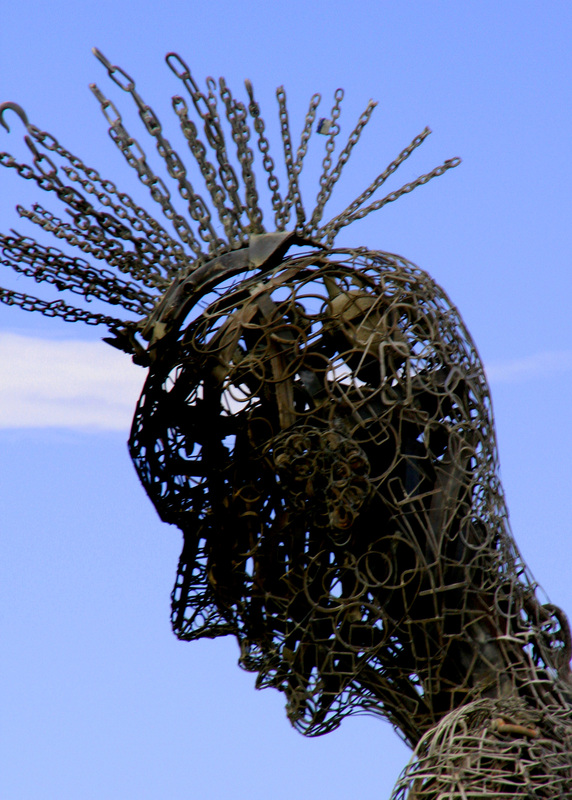 The 2007 theme for Burning Man was The Green Man. Artists were encouraged to develop pieces with an environmental message. Mike Ross, a New York sculpture artist, chose to cut up and weld together two 18-wheel oil tankers as a reminder of the impact oil consumption has on our environment. 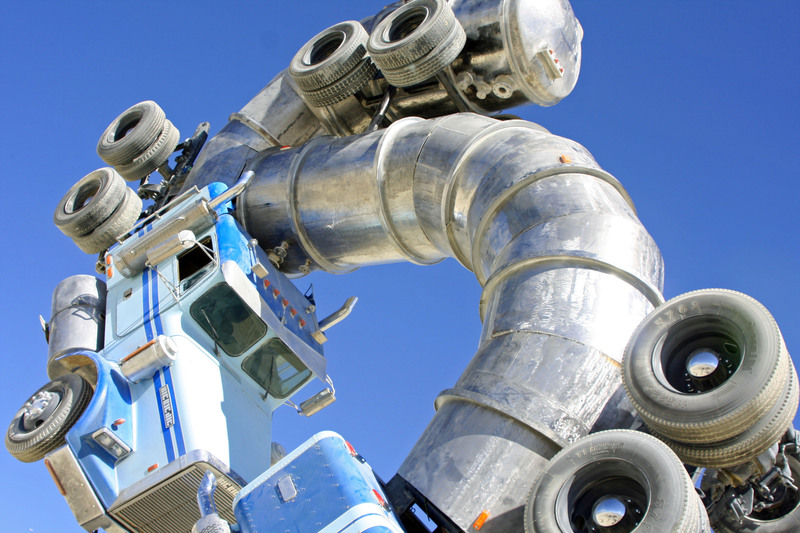 Like much Burning Man art, people were invited to climb over and into this 42-foot high sculpture titled the Big Rig Jig. 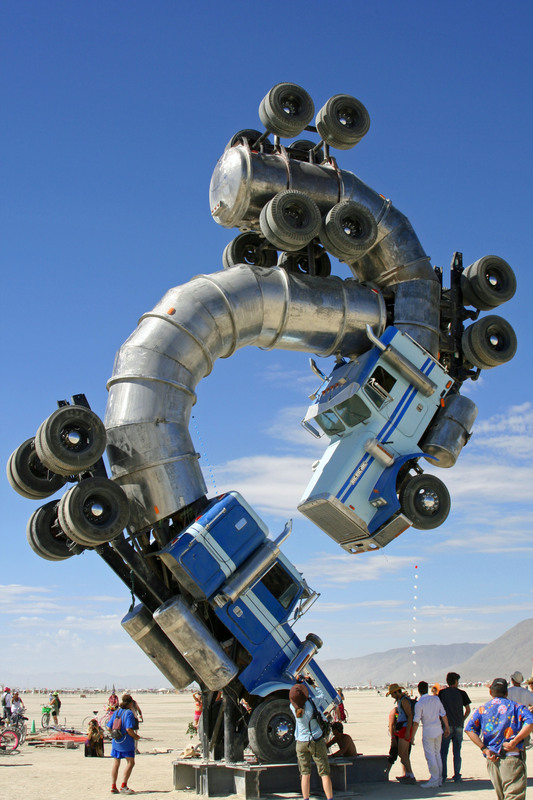 Two 18 wheel oil tankers were cut up and reassembled to create this 42 foot high sculpture created by Mike Ross of New York. 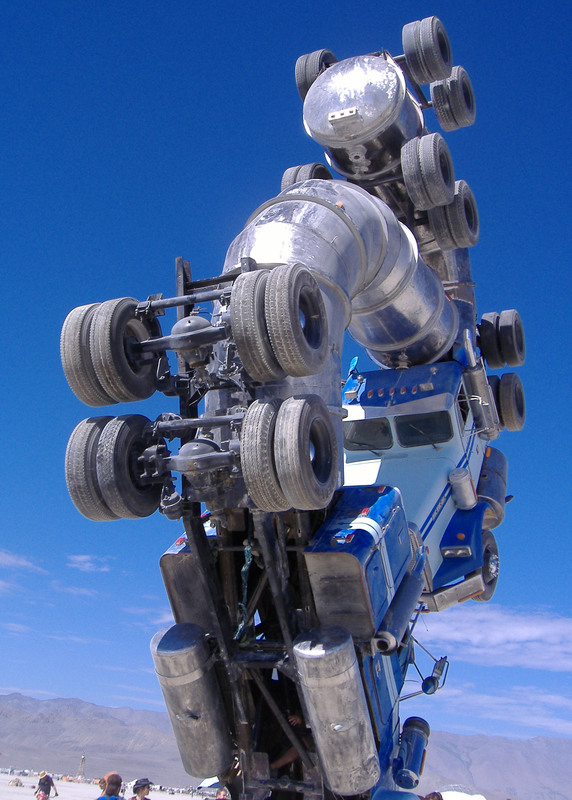 Another view of the Big Rig Jig by Mike Ross at Burning Man. Each year Burning Man selects a new theme and encourages artists to create works of art that reflect the theme. I really like this photo of the Big Rig Jig taken by my fellow member of the Horse-Bone Tribe and friend, Ken Lake. Dan Das Man who works out of the Bay Area has had several sculptures featured at Burning Man over the past decade. My favorites are his colossal human figures. 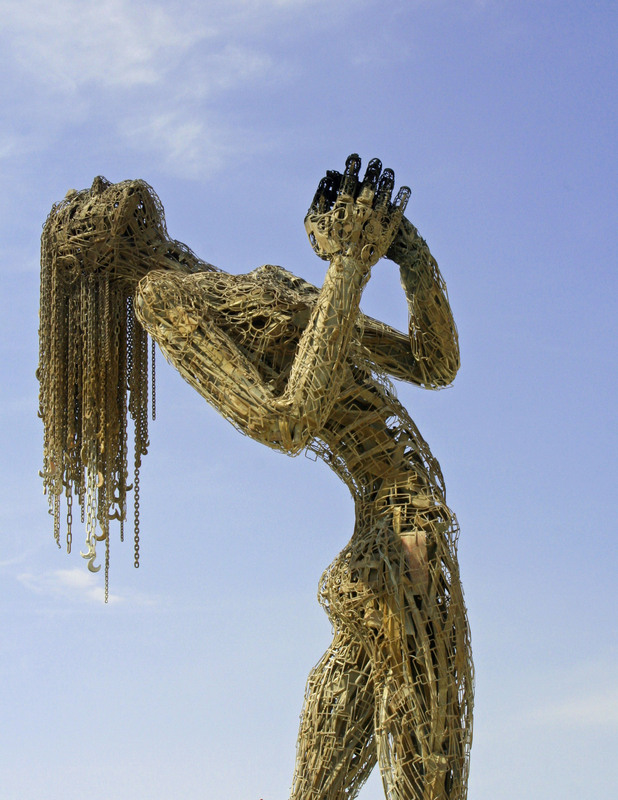 The statues by Dan Das Man at Burning Man are guaranteed to excite photographers and elicit emotions from Burners. A new definition for spiked hair? The bikes and Center Camp provide a perspective on the size of this sculpture by Dan Das Man at Burning Man. 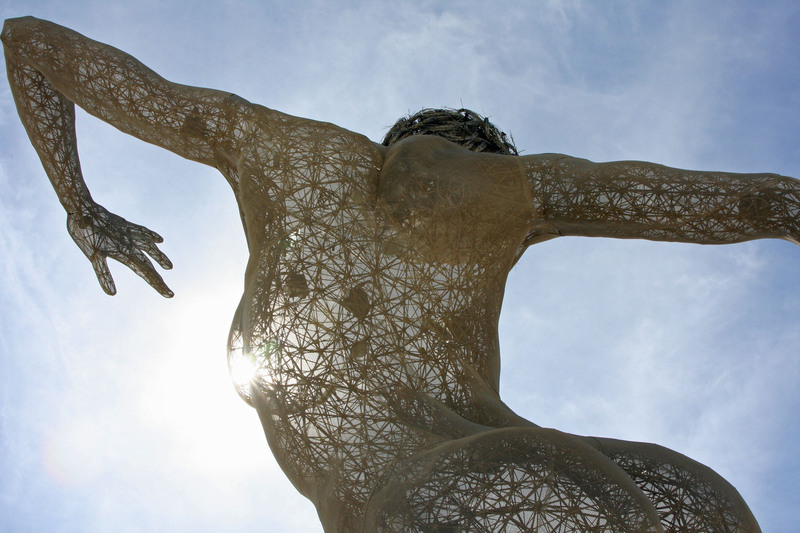 In 2010 it was the 40-foot high, 7000-pound sculpture Bliss that caught my attention. Treasure Island was the birthplace of this piece by artist Marco Cochrane. 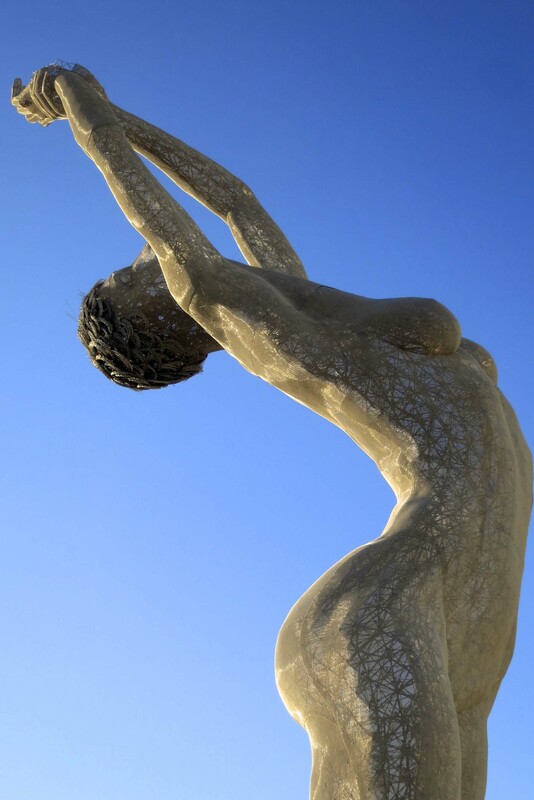 In 2010 the monumental sculpture named Bliss by its creator Marco Cochrane caught my attention. 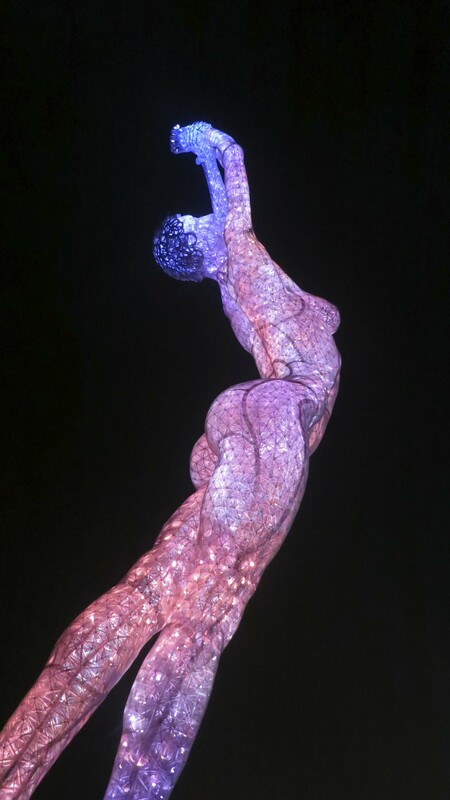 Almost any time of the day or night a crowd was gathered around the 42 foot tall, 7000 pound sculpture Bliss at Burning Man. 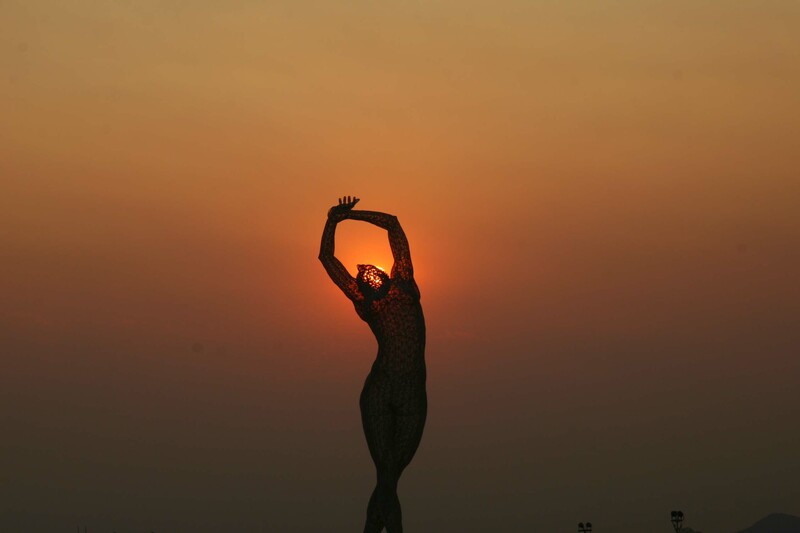 The sun provided a Kodak moment at Burning Man for this photo of Bliss. I added a green background in my final photo of Bliss.